“Sign up” to create a new Tinysponsor account for yourself. You may enter a “Signup Code” if you have one. After you have verified your account via your email. Log into your Tinysponsor account using your email address and password. When you log in for the first time, you will be greeted by this walkthrough wizard. As an influencer and content creator, you should select the “I am a Creator” button. Continue setting up your account by selecting “Get Started”. The walkthrough wizard will help you complete your set up in 3 easy steps. Let’s “Create your profile” in Step 1. You can create your very own Profile. Now let’s “Create your first package” in “Step 2”. A package tells Sponsors what you would do for a sponsorship. Here are several package examples. To create your package, select from one of these options below, the kind of sponsorship you want to offer. Each package can be for a different medium. Now, let’s enter some “Basic” information about this package. Move your cursor to the text entry sections and a blue box will appear to offer helpful suggestions. Now, enter in the package overview, as much “Details” as you can, what you are offering to the Sponsors. Get them excited to sponsor you! The packages in the examples above can also give you some ideas. Don’t forget, you can also include a gallery of images to show to sponsors. Tell us more about your audiences. It’s OK to estimate! You can find your audience “Demographics” from your social media account analytics. You can enter your own “Pricing” information or we can help suggest your estimated reach and price based on your connected social media accounts. Your reach is an estimate of how many people will see your posting. Your reach estimate can be based on the number followers, subscribers, attendees, or average views you typically have. 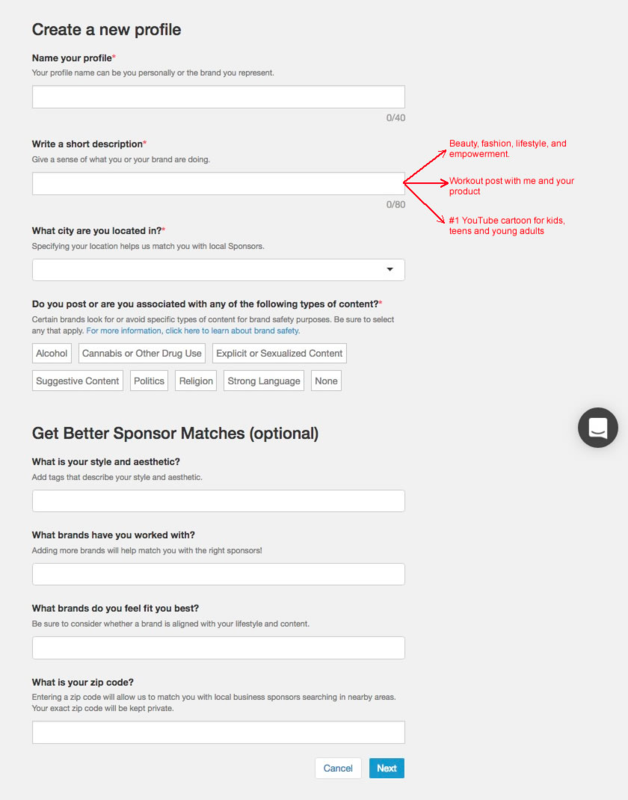 Next, you can set up some “Sponsor Questions” to request information for the sponsorship. You can start with our recommended questions and then ask for more information from Sponsors later. Let’s “Link your bank account” to your Tinysponsor account in “Step 3” so you can get paid. You can also do this later if you like. Your sensitive banking information is protected with 256 bit encryption and is secured by our processor Braintree (a division of PayPal) which maintains industry leading security standards. You can read all about the Braintree Payment Services Agreement at https://www.braintreepayments.com/legal/gateway-agreement and their bank agreements at https://www.braintreepayments.com/legal/cea-wells. You’re almost done. Select “Preview Package” to make sure everything in the package you just created looks good. Now that you’re ready, select “Publish” to go live with your package and Sponsors can start finding you!